Nobutake Kondō (近藤 信竹, Kondō Nobutake, 25 September 1886 – 19 February 1953), was an admiral in the Imperial Japanese Navy during World War II. 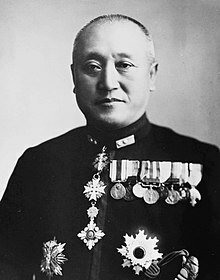 As commander of IJN 2nd Fleet, the Navy's principal detached force for independent operations, Kondō was regarded as second in importance only to Admiral Isoroku Yamamoto. In this Japanese name, the family name is Kondō . Kondō was a native of Osaka. He graduated at the head of his class of 172 cadets from the 35th session of the Imperial Japanese Navy Academy in 1907. As a midshipman he served on the cruiser Itsukushima and battleship Mikasa. After his commissioning as ensign, he was assigned to the cruiser Aso, destroyer Kisaragi and battleship Kongō. From 1912-1913, he was a naval attaché to the United Kingdom. After his return to Japan, he served briefly on the Fusō, then in a number of staff positions throughout World War I. From 1916-1917, he was chief Gunnery Officer on Akitsushima. After the end of the war, Kondō attended the Naval Staff College, and was promoted to lieutenant commander on 1 December 1919. From 1920-1923, Kondō was stationed in Germany, as part of the Japanese delegation to confirm Germany's adherence to the provision of the Treaty of Versailles. On his return to Japan, he was stationed for six months on the battleship Mutsu, and promoted to commander on 1 December 1923. From 1924-1925, he was an aide-de-camp to Crown Prince Hirohito. On completion of this task, he became an instructor at the Imperial Japanese Navy Academy and was promoted to captain. He subsequently served in a number of positions on the Imperial Japanese Navy General Staff. He was captain of the Kako from 1929–1930 and of the battleship Kongō from 1932-1933. Kondō was promoted to rear admiral on 15 November 1933, Chief of Staff of the Combined Fleet in 1935, and vice admiral on 15 November 1937. After the start of the Second Sino-Japanese War, Kondō commanded the IJN 5th Fleet in the Hainan Island Operation and Swatow Operation off of southern China. At the time of the attack on Pearl Harbor, Kondō commanded the IJN 2nd Fleet, participating in the invasions of Malaya, the Philippines and the Dutch East Indies. He was overall commander for the Indian Ocean Raid. During the Battle of Midway, he commanded the Midway Occupation Force and Covering Group. Subsequently, his forces played a leading role during the Guadalcanal campaign, seeing combat in the Battle of the Eastern Solomons (23–25 August 1942) and the Battle of the Santa Cruz Islands (26–27 October). Kondō also led Japanese forces at the Battle off Savo Island (12–13 November 1942). After the first Naval Battle of Guadalcanal (15 November 1942), Kondō personally led the battleship Kirishima along with cruisers Atago, Nagara, Sendai, and Takao, in what was to have been a decisive attack to eliminate the threat from Henderson Field through a massive nocturnal shelling. Instead, Kondō was confronted by an American task force with battleships USS Washington and USS South Dakota, and was defeated, losing Kirishima. This defeat marked a turning point of the entire Guadalcanal campaign. Kondō was apparently tainted by the Guadalcanal failures, and was soon removed from seagoing commands, or indeed any positions of real authority. Yamamoto's demotion of Kondō was nonetheless less harsh than that of his predecessor, Hiroaki Abe, due to Imperial Navy culture and politics. Kondō, who also held the position of second in command of the Combined Fleet, was a member of the upper staff and "battleship clique" of the Imperial Navy while Abe was a career destroyer specialist. Kondō was not reprimanded or reassigned but instead was left in command of one of the large ship fleets based at Truk. Kondō was appointed Deputy Commander of the Combined Fleet in October 1942 and was promoted to full admiral on 29 April 1943. He became Commander in Chief of the China Area Fleet from December 1943 until May 1945, when he was appointed to the Supreme War Council (Japan). ^ Nishida, Hiroshi. "Imperial Japanese Navy". Retrieved 2006-12-08. ^ a b c d L, Klemen (1999–2000). "Vice-Admiral Nobutake Kondo". Forgotten Campaign: The Dutch East Indies Campaign 1941-1942. ^ Hara, Japanese Destroyer Captain, 157, 171. Parrish, Thomas (1978). The Simon and Schuster Encyclopedia of World War II. New York: Simon & Schuster. ISBN 0-671-24277-6. Van Der Vat, Dan (1978). Pacific Campaign: The U.S.-Japanese Naval War 1941-1945. New York: Simon & Schuster. ISBN 0-671-79217-2.